Even before MSC Sinfonia sets sail, stepping on board is like embarking on a voyage of discovery. With its impressive array of new features and facilities, the ship is now even better equipped to satisfy every need. We’ve added spacious new staterooms with balconies to delight our guests with superb panoramic views. We’ve included a new 3433 sq. ft. area to be filled with music and dancing. With the help of prestigious partners like Chicco, LEGO and Namco, we’ve created fabulous new play areas for children of all ages, starting with an exciting spray park packed with fun water features. And to offer even more routes to relaxation, we’ve enhanced the lavish MSC Aurea Spa with more space for massages. The Teatro San Carlo Theatre is an ultramodern reinterpretation of traditional lines. Please note that access to the theatre for the evening shows is by booking only (not needed for the other ships). All this is just a taste of what a cruise on MSC Sinfonia can offer. There’s a world of new experiences to discover on board, day after day, moment after moment. Because MSC Sinfonia is the ship that suits you. 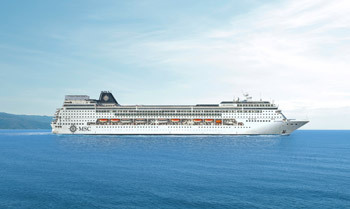 View all MSC Sinfonia cruises, view a selection of MSC cruise deals, or view more options for MSC cruises. MSC Cruises’ uncompromising dedication to its passengers is nowhere more evident than the unrivalled entertainment programmes and facilities offered on board MSC Sinfonia, with its about 600 state-of-the-art seats Teatro San Carlo, futuristic Pasha Club Disco and San Remo Casino with over 400 square metres of casino gaming and Galaxy Video Games, video games room. MSC Sinfonia offers 2 main restaurants, Il Galeone and Il Covo and an buffet restaurant, La Terrazza. Each one boasts a top gastronomic selection thanks to the variety of dishes and the high quality of the foods, from choice Italian meats, scrupulously controlled, to fresh fruit. Every product is fresh and carefully handled, such as bread baked on board with the passion and knowledge of the most distinctive boulangerie. Dishes range from traditional and tasty Mediterranean fare, to the most refined international recipes. For a quick lunch choose Caffe del Mare buffet restaurant offering the utmost quality and variety in Italian and international cuisine. On MSC Sinfonia guests can choose from 8 bars, inspired by different themes and inimitable in their wine and food selection, thus satisfying even the most sophisticated and demanding palates. Length / Beam / Height: 899 ft. / 105 ft. / 177 ft.